We didn't do these in one go, I've lumped the weekends walking into one post. This weekend was supposed to have been the 5 sisters but the weather forecast kinda binned that idea. Late on Friday afternoon the forecast improved slightly from 20% to 20% increasing to 70%. 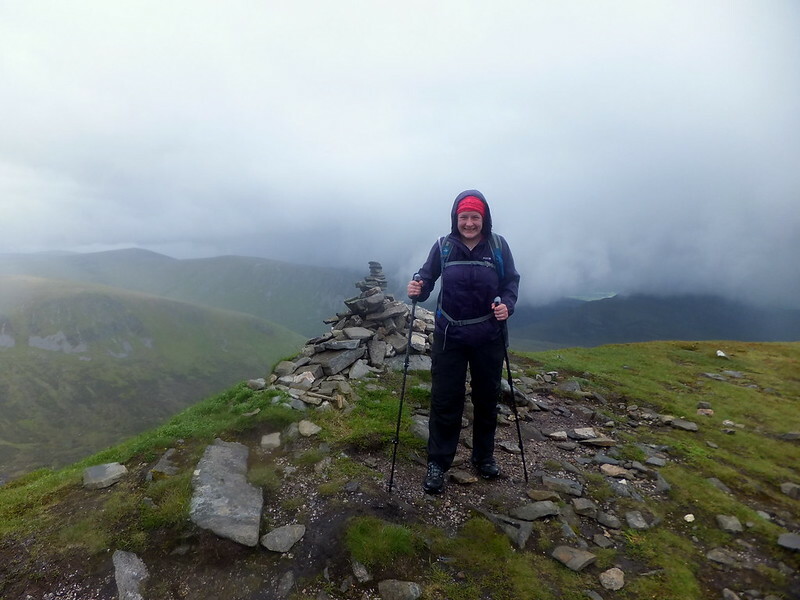 We binned the idea of going up to Kintail as a ridge walk is much better when it's clear, so we settled on the Monadhliath. We set off from Dundee around 0730 and headed for Newtonmore (with a stop for a Maccy D's breakfast en route) we finally arrived around 10 and were away for about half past. Initially the walk in was very pleasant, walking through Glen Banchor following the burn up towards the footbridge, the skies at this point were, quite blue with a few clouds but nothing to really worry about. Once over the footbridge, we stopped for a wee 5 minutes before following the path a bit more steeply up. Unfortunately while on this path it looks like we came of it a bit too early (following another path) and ended up in ankle deep bog, we continued up towards the head of the corrie while trying to get ourselves back on track. this was slow progress but eventually we stumbled on to some sort of path and we made our way quicker further up, finally arriving at the head. This was the 1st real steep bit we'd encounter, so a quick pitstop was required before plodding our way up to the bealach. 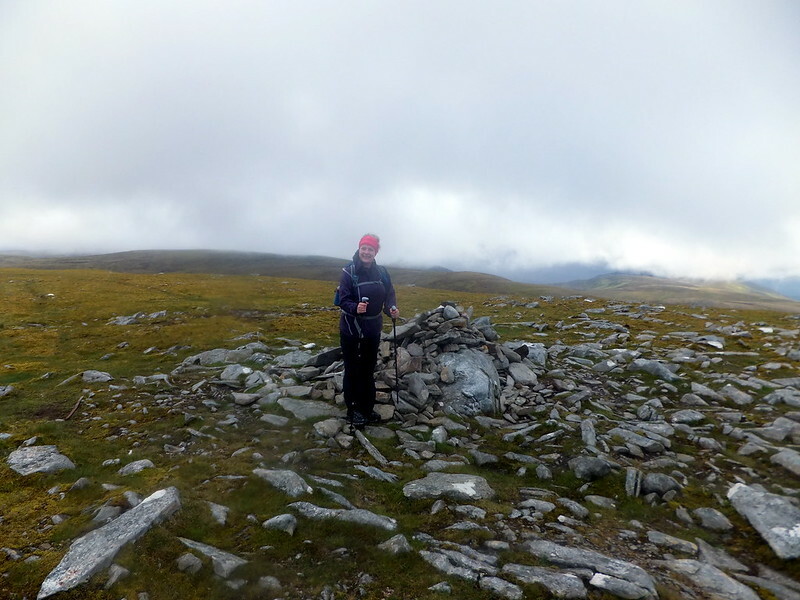 Once up it was a wander over to our left to bag our 1st target of the day Carn Dearg, this was the best summit of the day, best views around, and the cairn perched quite nicely. 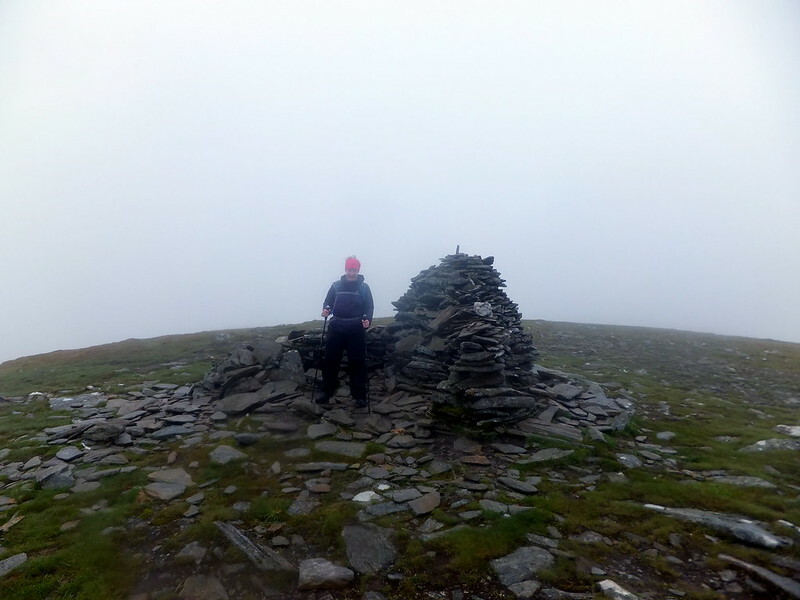 Leia had spotted a windshelter on the way up, so we decided this would be a good place to head round to and stop for lunch and celebrate our 1st summit of the day. The walk round the plateau towards Carn Sgulain is really best described as, non descript, the weather probably didn't help as the clag rolled in and out bringing with it some showers but on the few occasions the sun came out, it was really quite pleasant. 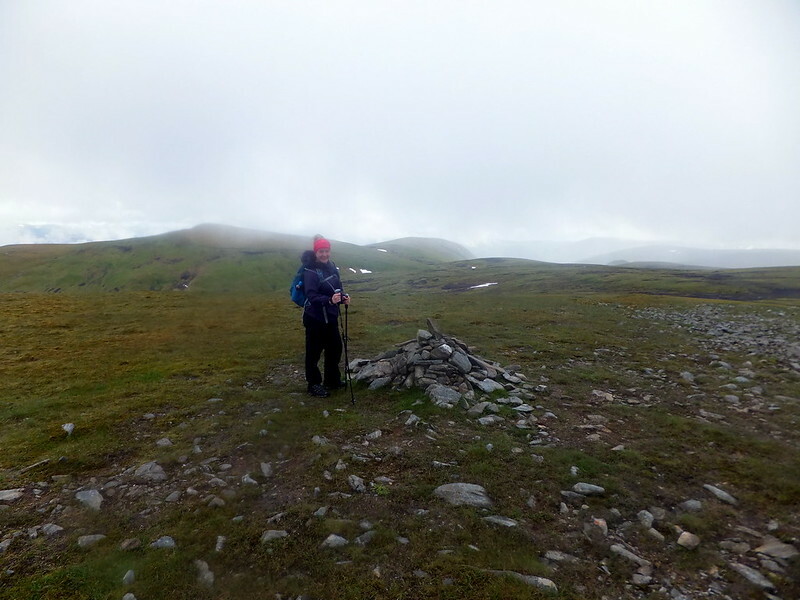 As we approached Carn Sgulain my heart sank, I'd never seen a bog field like it, it just seemed to roll on forever, we kept picking a route through then doubling back to find another and so on till we hit firmer ground and we bashed on towards the summit, finally reaching the summit cairn, or was it? Just a bit further on there was another cairn which looked higher than where we were, so we strolled over, looking back the other one was higher...aaaargh. Photo at both then head off again. Heading back down and looking over to our 3rd and final target, the bog again just seemed to head on forever, this truly was pathless terrain as we couldn't pin point a single way over to where we had decided to head up A'Chailleach, so we just did the same again, pick a line, double back, pick another line etc etc etc, finally we were at the foot and headed up, bit of puffing and panting required and we had reached the summit, happy days, I've broken 70 and Leia celebrated her 21st. All that was left now was the long trudge back to the car. This trudge really was long, laborious and very wet, there is a faint path to follow but it keeps disappearing and reappearing somewhere else, passing an old tin hut, that appeared to have been padlocked shut towards the burn. A spot of bolder hopping and the theme continued till finally we hit a decent track that would lead us back to the car. Once back at the car a beer and fag was very much in order before getting changed and heading off to Tulloch to our beds for the night.